A tree is planted and dedicated to the descendants of Thomas Jefferson and his slave, Sally Hemings, at Monticello’s Mulberry Row. Mulberry Row was the center of activity of Jefferson’s 5,000-acre agricultural enterprise. According to the Monticello website, it was populated by more than 20 dwellings, workshops, and storehouses between 1770 and the sale of Monticello in 1831. PITTSFIELD — History can play a crucial role in our futures, if we listen to it. The book details, in family album and portrait style, Lanier’s trip across the country to retrace the footsteps of his maternal ancestor, Madison Hemings, the son of Thomas Jefferson and Sally Hemings. Hemings was Jefferson’s African-American slave. With increasing discussions and divides developing across the nation regarding race and rights, Lanier and Feldman have decided to revive a series of tours and talks — originally conducted after the book’s release — about the book and its themes of identity, family and the varying perspectives of American history and culture. …The co-authors also noted how people aren’t always as they seem; for example how many light-skinned members of the Jefferson-Hemings lineage would go on to “pass” in society, that is, take advantage of the social statuses that came with looking like a white person, including freedom from slavery. Personal testimonies from descendants of Thomas Jefferson and Sally Hemings pose important questions about equality, freedom, and family. On October 31, 1998, the Associated Press broke the news that there was finally scientific proof for what many people already knew was true, but others would not believe: Thomas Jefferson had a relationship with his slave Sally Hemings after the death of his wife. This DNA link was proven through the Eston Hemings line. 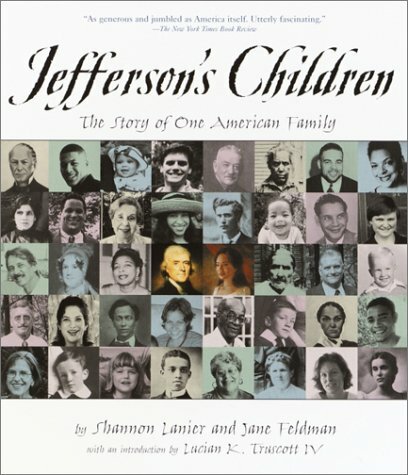 Jefferson’s Children is the story of the Jefferson and Hemings families, and their efforts to be recognized and united as proud descendants of this great American genius. Some discovered their heritage through written family records, and others have based their beliefs on oral histories. Regardless of their sources, many descendants of Thomas Jefferson and Sally Hemings want the world to know that skin color isn’t what makes a family. Thomas Jefferson wrote about equality. He believed in freedom. Yet, he owned slaves. This contradiction in character raises many questions among historians and descendants as they unravel the “truth” about this complex man. Did he indeed father children with his slave, Sally Hemings? How would he view the issues of racism among his ancestors today?